A new study from Cornell University shows that when the “Hot Jupiters” approach their host star, the planet can force the star’s spin axis to precess much like a wobbling, spinning top. According to new Cornell research published in Science, these large, gaseous exoplanets can make their suns wobble after they wend their way through their own solar systems to snuggle up against their suns. “Although the planet’s mass is only one-thousandth of the mass of the sun, the stars in these other solar systems are being affected by these planets and making the stars themselves act in a crazy way,” said Dong Lai, Cornell professor of astronomy and senior author on the research, “Chaotic Dynamics of Stellar Spin in Binaries and the Production of Misaligned Hot Jupiters.” Physics graduate student Natalia I. Storch (lead author) and astronomy graduate student Kassandra R. Anderson are co-authors. In our solar system, the sun’s rotational axis is approximately aligned with the orbital axis of all the planets. The orbital axis is perpendicular to the flat plane in which the planets revolve around the sun. 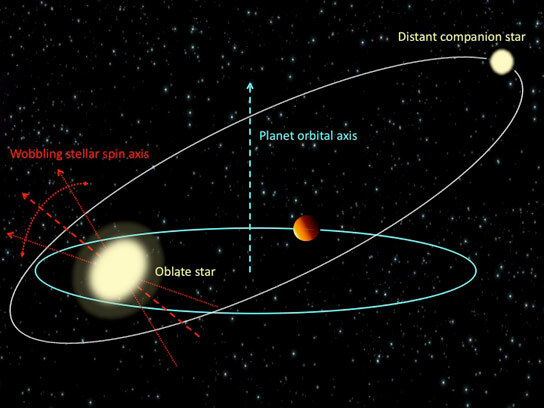 In solar systems with hot Jupiters, recent observations have revealed that the orbital axis of these planets is misaligned with the rotational axis of their host star. In the last few years, astronomers have been puzzled by spin-orbit misalignment between the star and the planets. Roasting like marshmallows on an open fire, hot Jupiters – large gaseous planets found throughout the universe in other solar systems – wander from distant places to orbit extraordinarily close to their own suns. So far as astronomers know, this only happens in binary star systems. Partner binary stars, some as far away as hundreds of astronomical units (an astronomical unit is 93 million miles, the distance between Earth and the sun), influence the giant Jupiter-like planets through gravity and cause them to falter into uncommon orbits; that, in turn, causes them to migrate inward close to their sun, Lai said. By simulating the dynamics of these exotic planetary systems, the Cornell astronomers showed that when the Jupiter-like planet approaches its host star, the planet can force the star’s spin axis to precess (that is, change the orientation of their rotational axis), much like a wobbling, spinning top. Lai noted that the chaotic variation of the star’s spin axis resembles other chaotic phenomena found in nature, such as weather and climate. The research was supported by the National Science Foundation and by NASA. Be the first to comment on "‘Hot Jupiters’ Can Force Their Host Stars to Wobble"